This Nagoya magnetic antenna is particularly intended for reception on VHF-UHF bands from 100Mhz to 180Mhz and 400 to 500Mhz approximately (RX only). The antenna is delivered with a magnetic mini-socket and a coaxial cable 50 ohms RG174 with a length of 3 meters and available with cable connector in SMA Male or Female. Comes with: Nagoya UT-106 antenna with 3 meter coaxial cable and SMA male connector or SMA Female (to be selected below). Description: This Nagoya magnetic antenna is particularly intended for reception on VHF-UHF bands from 100Mhz to 180Mhz and 400 to 500Mhz approximately (RX only). 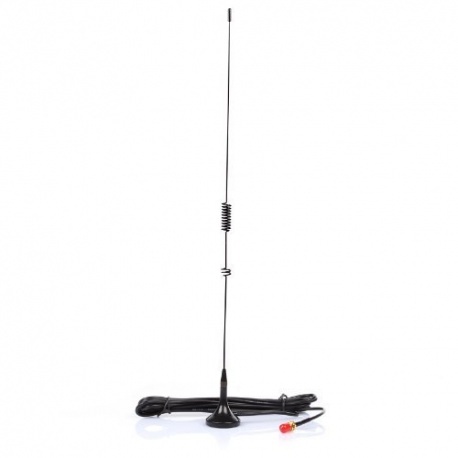 The antenna is delivered with a magnetic mini-socket and a coaxial cable 50 ohms RG174 with a length of 3 meters and available with cable connector in SMA Male or Female. Comes with: Nagoya UT-106 antenna with 3 meter coaxial cable and SMA male connector or SMA Female (to be selected below).